Rimsky-Korsakov's famous symphonic suite "Scheherazade" has been a staple of the symphonic literature since it was first written in 1888. Now your younger students can enjoy this Russian master's colorful orchestrations and imaginative themes in this "true-to-the-original" arrangement. 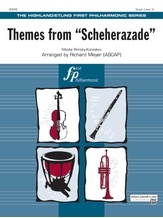 Included are the Sultan's theme, Scheherazade's theme (for solo violin), "The Story of the Kalendar Prince" theme, and "The Young Prince and the Young Princess" themes. With plenty for every section to do, this arrangement is perfect for any concert or as a festival/contest selection.